"Jarfly" is a common Appalachian term for the cicada. The metamorphosis of the cicada — a creature that spends up to 17 years underground before emerging, sprouting wings and joining in flight and song with thousands of companions — is a magical thing, and in a lot of ways it parallels the transformation of the brewery building and the creation of a local craft brewery. Our building, a landmark on Somerset's downtown Fountain Square, was the home of Goldenberg's Furniture for 150 years before closing in 2009. As part of our renovation efforts, we've peeled off layers of time to reveal this building's beautiful interior structure. The bench seating and table tops have been hand crafted by a local artisan with the wood we reclaimed from the original Goldenberg’s showroom. The centerpiece of our bar is the two-ton safe that was used as part of the store's operations since the early 1900s. 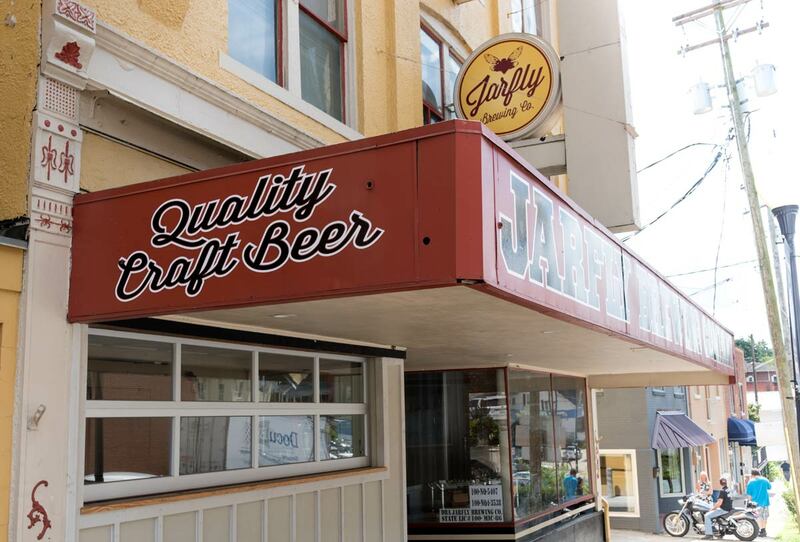 We invite you to join us at Jarfly Brewing as we make some magical memories in the Lake Cumberland area's first craft brewery. We're open Thursdays through Saturdays from 4 pm until midnight, and Sundays from 1 to 7 pm.